Jorge Alberto Hughes is a HR Manager at Bank of America and lives in Valley Ranch. Q: Why did you decide to join the Get You In Shape program? My son (6) and daughter (2) drive me. My “leisure” time is spent with them, and they are world class athletes! I need all of my energy and an extra amount to keep up with them and give them the quality time they deserve. When my wife stumbled across GYIS on Facebook, we looked at what the program is about, the plan, stories, and the community it creates. We decided to give it a shot and I joined the 28 day program. Q: What was your life like before joining the Get You In Shape Program? I have had a great life, doing what I want, eating what I want but not liking the consequences of doing so. I played several sports growing up, however I had always hated running. Q: What was your first impression from the Get You In Shape program? The first day, I started out with a group of like-minded individuals: lead a healthy lifestyle. We all do it for different reasons and what is great about GYIS is that it brings us together to achieve success. I felt welcome into the group and community. Trainers have gone thru my struggles, know my name and make me feel human, versus just being a number or another metric in their score card. After the 1st week, everything was hurting. It was a good hurt, and I found myself wanting to come for more. My wife was surprised that I would get up (without a push and shove match) at 4:50am to go and work out. This had never happened in my life! I want to be there for the team, but now have my children in mind when I am going thru the decision of getting up and going versus sleeping in for an additional hour. I am learning food choices that are good for me and it has been an easier transition than what I had expected. After my 1st month, I am wearing clothes that I had put to the side; I have more energy to play with my children and am more focused at work; and I find myself craving the workout. I did my first 5k ever!!!!!!! It was an amazing experience, and am looking to do it every month! Q: What have been some of the tools you have used that have benefited you? The most important tool for me is the GYIS community. It is such a welcoming and inspirational environment that I am enticed to wake up early in the morning to work out with a happy and delightful group. I use the recipe guides to plan my weekly meals and the shopping lists to get everything lined up ahead of time. I stay engaged thru Facebook as I learn tips and tricks, as well as hear from the community on what is working for them. I have been using the suggested nutritional supplements and products, and enjoy them all. Spark is a powerful energy supplement that I use to drink instead of the other commercial products that are out there. It gives me the energy boost without the down time later. I have been toying around with My Fitness Pal and am coming to grips with using it on a daily basis. It helps me understand what I am putting into my body and how it is affecting it. The hardest part is getting the meal plan set up, however it is a breeze to use after this. 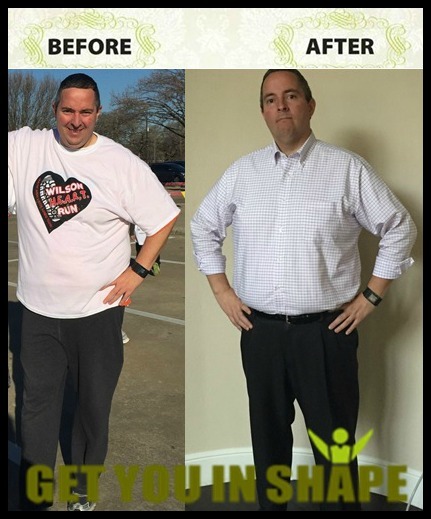 Q: How is the Get You In Shape program different from other programs you have tried before? The community and accountability coach are what takes the program to the next level. 50+ people getting up to work out at 5:30am has the potential to be a grumpy crowd. With GYIS it is not the case, we are a cheerful and supportive group. Before you can feel it (you do feel it later in the day) the workout has come and gone. GYIS has a structured program that does not feel stuffy and rigid. It is easy to do and follow, and you have several people that enjoy your success as much as you do. Billy is AWESOME! Q: What results and benefits have you experienced in the Get You In Shape Program? In 5 weeks I have lost 10 pounds and 13 inches (from different body parts). I have more energy to play with my kids. Before the program I remember lying down on the floor at night playing with my 2yo, now we are dancing and running around in the evening and I am playing soccer or football with my 6yo. My family is proud of what I have been able to accomplish so far and motivating me to keep on with the journey! I no longer dread the summer, and am looking forward to going to the beach. I want to run on the beach, yes, I no longer hate to run. Q: What would you say to anyone looking at this program? Don’t think, just do! It is a choice that I made, try it out and you will find that it is easier to embrace the program because of the community and how good they make you feel. You will realize that you have it in you (always did); GYIS helps with this self-discovery!